Fashion students had a unique opportunity to enhance their knowledge of Ancient Egyptian culture when historian Professor Joann Fletcher paid a visit to her hometown. 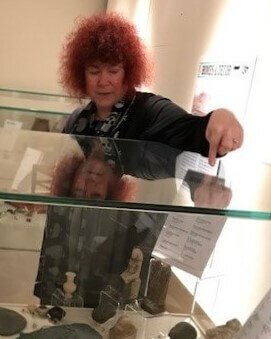 Barnsley-born Egyptologist Professor Fletcher, a former student at the College, discussed in detail her exhibitions at Experience Barnsley and talk to students about the artefacts and their connection to Barnsley. Professor Fletcher brought the exhibition to life and enabled students to understand the complexities of ancient Egypt and how different social classes approached fashion. Students have used the information provided by Professor Fletcher and further research to develop a range of garment designs and textile sample as part of a collaborative assignment, working for an audience.